Up for consideration is a trendy warm weather outfit called "Summer for Tonner's 22" American Model Dolls. 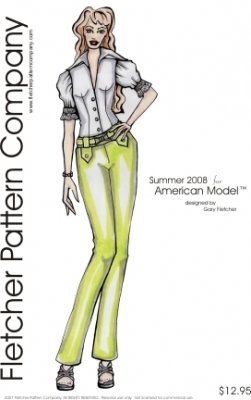 The pattern features a short sleeve button up top and pants. This design is also available for the Super Deluxe DeeAnna Denton Dolls. The pdf version prints on A4 and 8 1/2 x 14 legal size paper. Notions 6ct. 4/0 sized snap sets, 6ct. 3/16” buttons, 1ct. 3/8” belt clasp or buckle, approx. 10” ¾” wide lace, matching thread, scrap of fusible interfacing.